The battery can be connected to its + and – points. It has a charger socket to charge battery. 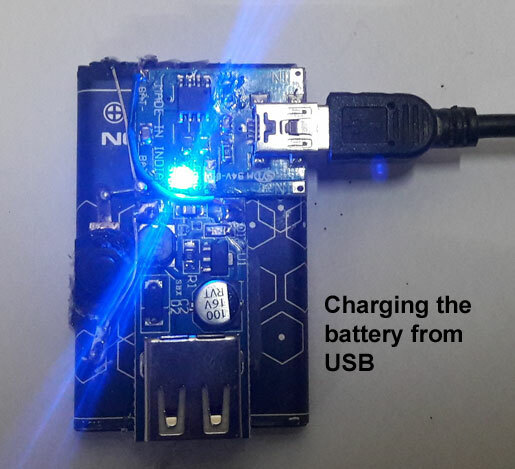 USB cable can be used to charge the battery via the module. During charging, Red LED lights and when the battery attains full charge, Red LED turns off and Blue LED lights. 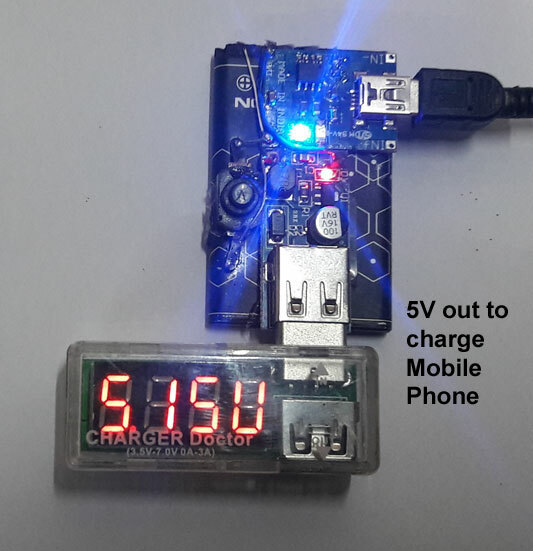 It converts the 3.7 volts from the battery to 5.1 volt to charge the Mobile phone.Its USB socket can be used to connect the mobile phone.When it gives output, a Red LED lights.It gives 1 ampere current at 5.1V. 3. 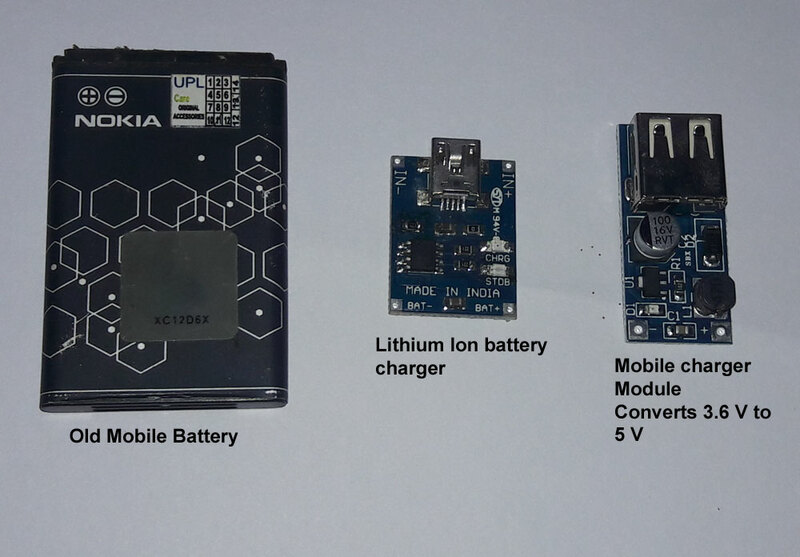 Connect the +ve of the Mobile charger module to the +ve of battery via a Mini switch. 4. Connect the – ve of the Mobile charger module to the – ve of battery directly. Connect the USB cable to the Lithium Ion battery charger and the other end to Laptop USB or Mobile charger USB. Battery will start to charge and Red LED lights. When the battery attains full charge, Red LED turns off and Blue LED lights. Now the battery is full. Press the switch. Red LED of the Mobile charger lights indicating the output. 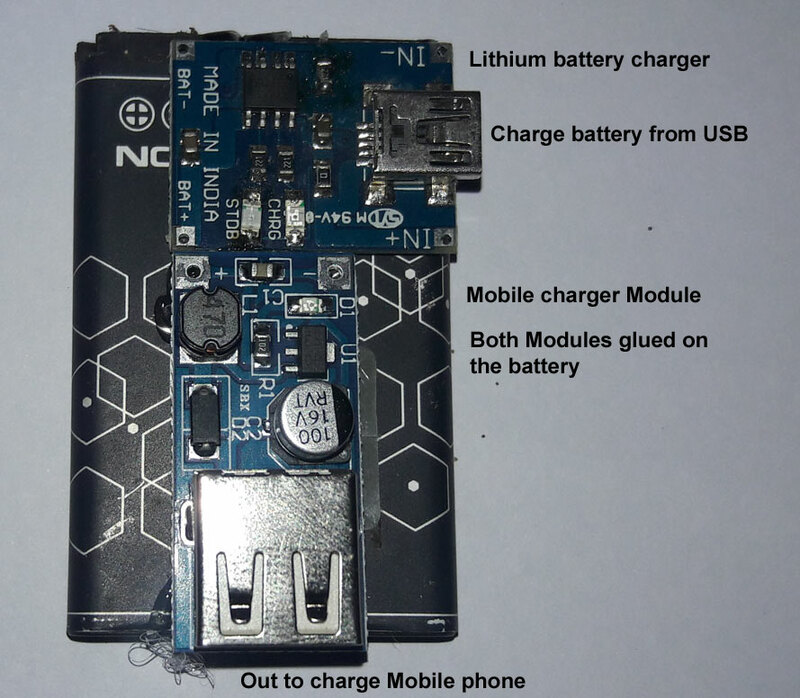 Now connect Mobile phone using USB cable. Phone will charge. This Mini Power bank can charge the Mobile phone during travelling. You can use any Old Mobile phone battery. If its mAh is higher, say 2700 or higher, you can charge the phone many times.